As the Christmas season heads into full entertainment mode, many of us will be invited to holiday dinners, Open Houses or workplace parties. Along with all of that celebrating, it is always nice to bring something for the host or hostess. Today, I have some ideas for you that could be a real game changer in the age old dilemma of what to take as an appropriate hostess gift. 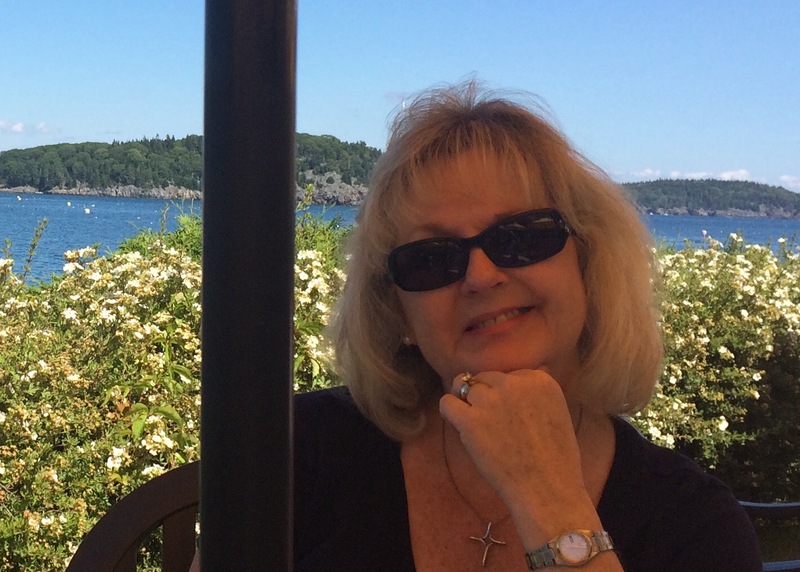 During our six and a half years living in Hawaii, I served in a volunteer position for four years as the Display Chairman on the board of directors for a wonderful gift shop on Pearl Harbor Naval Shipyard that was run by military wives. It was this experience, along with the amazing women I worked alongside during this time, which ultimately gave me the confidence and desire to open my own home décor store in 2006. While I owned the store, I was asked two years in a row to do seminars on holiday table displays for the Joint Spouses Conferences held at various military bases on Oahu. They took place over two days, and women would sign up to attend a variety of one hour seminars. At the first seminar, I put together a Thanksgiving tablescape, and then a Christmas version. Probably due to my adrenalin kicking in, I finished both table centerpieces in 40 minutes. Oh, what to do with that extra time? So I opened it up to decorating questions, of which these young military wives had many. Whew! I got through day one. Looking ahead to day two, I realized I needed to plan something for that extra 20 minutes. I looked around my store and gathered up baskets full of lovely hostess gift ideas that would cost about the same as a nice bottle of wine. There were soaps, dish towels, dip bowls and spreaders, holiday napkins, lotions, and beautiful smelling candles. On day two, after I finished my table display presentations, I brought out various gift ideas that people could take to the hostess besides a bottle of wine. I talked about the fact that a hostess gift is really a thank you for the person who sent out the invites, cleaned the house, made the food, and got everything “party ready.” What if he or she doesn’t like wine, or even drink for that matter? Why not instead give them something they will remember like a decorative dish towel, handmade goodies, or an assortment of gourmet coffees or teas? 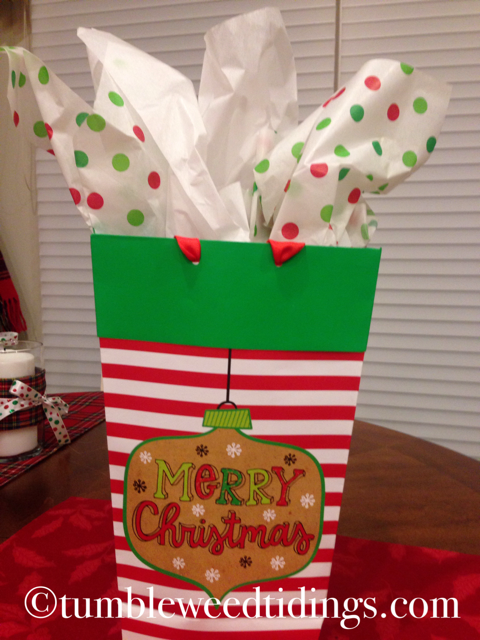 The hostess gift idea seemed to go over well, and I had no sooner driven back to the store when people started coming in to purchase items I had shown. #ontosomething! 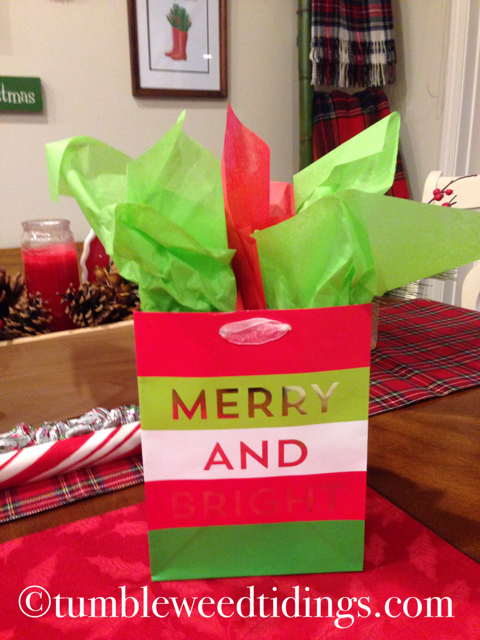 The first hostess gift idea is one I used last week, and although it was a holiday dinner party, it was still in November so I went with a more generic theme. 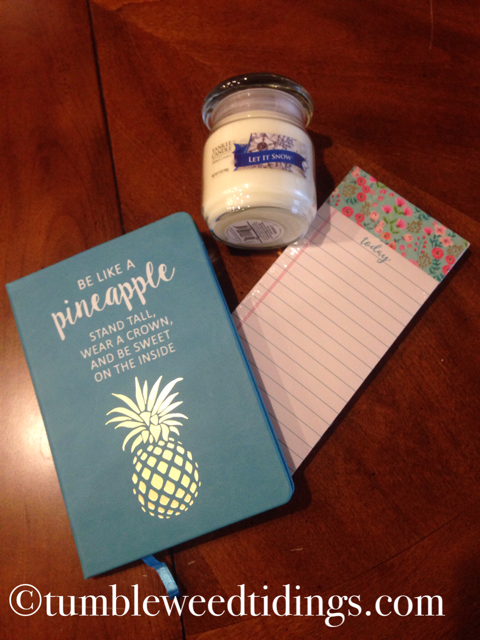 A cute notepad, a leather journal and a festive candle made up this gift, completed by a handwritten note on one of the lovely notecards my mother makes. Total cost about $14. The second gift consists of three holiday dish towels and a foaming Christmas scented hand soap, both found at a local store for a total cost of $10. 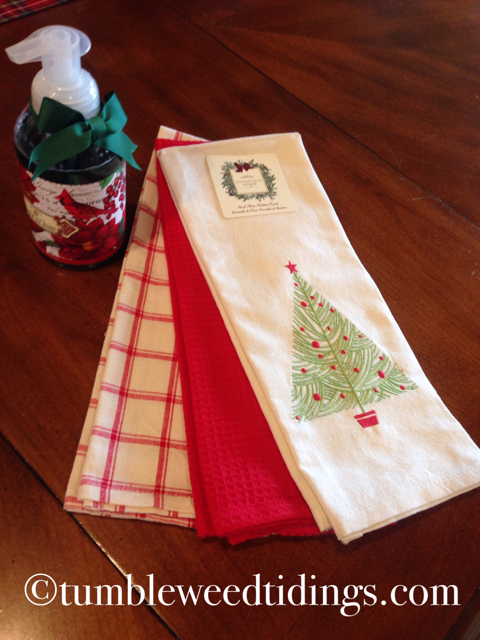 Who wouldn’t like a fresh holiday kitchen towel to hang, as well as a fragrant seasonal hand soap? 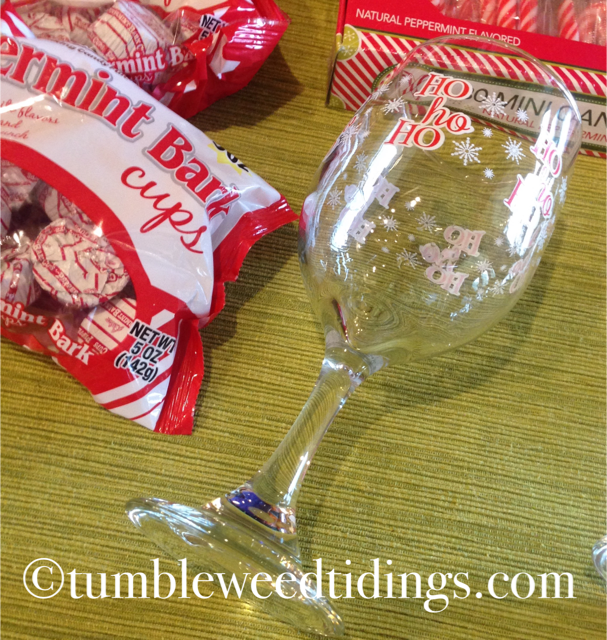 The third hostess gift idea is made up of two cute “ho ho ho” wine glasses filled with peppermint bark candies and candy canes, and a package of whimsical napkins. I purchased the wine glasses and candies at the Dollar Tree, making the cost with the napkins about $7. 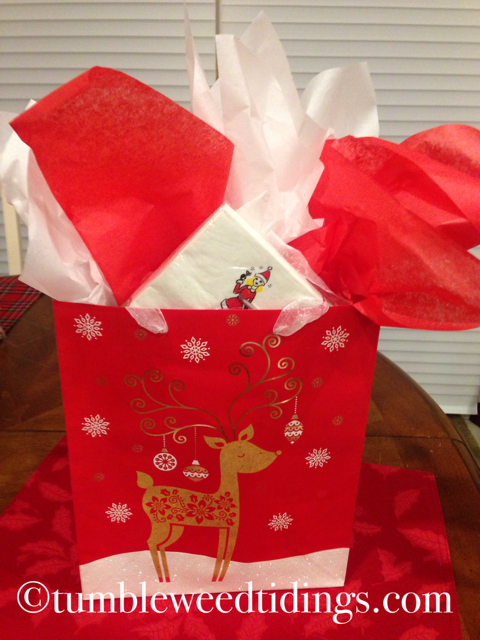 I won’t tell if you won’t, because this gift looks like so much more! The addition of a bottle of wine is optional, but appropriate. 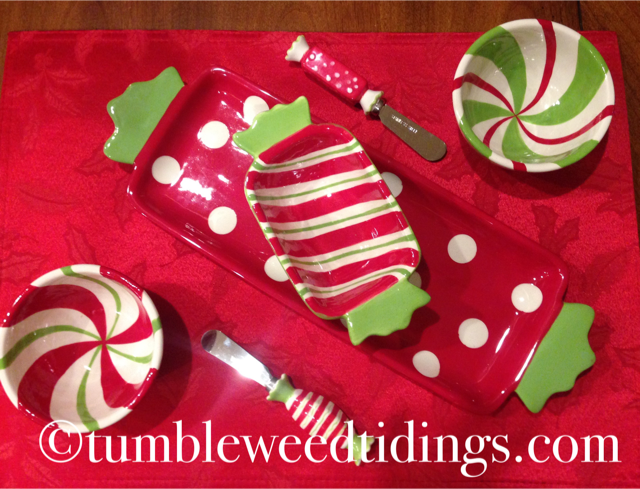 The last option is a set of dip bowls and spreaders with a coordinating tray, also under $20. What hostess wouldn’t love this gift to use at her next party? 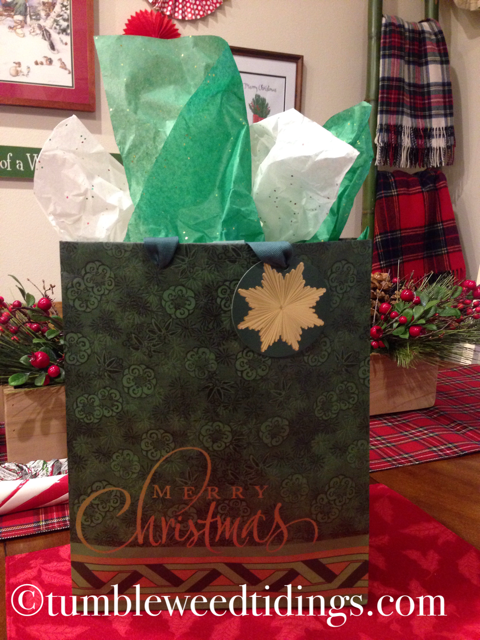 When wrapping your hostess gift, remember that presentation is everything. It is possible to take a humble gift and elevate it to something quite special, just by wrapping or bagging it up in a classic, festive way. Having these gifts made up and ready to go at the beginning of the season has an additional bonus. Even if you never need them as hostess gifts, they may come in handy when someone drops by with an unexpected gift. You can smile, say thank you and hand them one of these packages. As we enter this time of joyous celebration leading up to Christmas, get creative when selecting host/hostess gifts for those who are opening their homes up to you. Your gift will stand out in the sea of wine bottles as something that took some time and thought to put together, and something the hostess will truly enjoy using. Love it! Will do it right away! Thank you! Thank you, I’m glad you like it! I have about four done, now just waiting for the parties to arrive. Great blog! Diane, you are always such a thoughtful & kind person. Jim is also. We are so glad to call you both friends! Thank you Terri! I really appreciate your support of the blog. This is so interesting and has great ideas. Thank you for mentioning my cards.